Some 40 first year students joined with faculty and staff at the annual FGP welcome dinner. During the second week of classes in September, the First Generation Program (FGP) organized an annual dinner to welcome first generation students from the incoming Class of 2021. The program, which is part of the Undergraduate Advising and Academic Planning (UAAP) Office, provides support for students who are the first in their family to go to college—some 18% of this year’s incoming students. 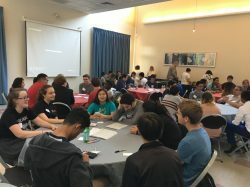 About 40 freshmen joined two representatives of the Student Advisory Board and 10 first generation MIT faculty members, including Denny Freeman, Ed Bertschinger, Scott Hughes, and TL Taylor. The event included a screening of the UAAP’s short video I Am First Generation, in which MIT faculty and students discuss their experiences and their paths to MIT. The room echoed with conversation well past the clip’s end. FGP has several events planned for the fall, including a luncheon with faculty and Vice Chancellor Waitz on November 16 and a Going Home event on November 30, which addresses the feelings, conversations, and conflicts that might come up when our students head home for the first break of their college experience.